Vladimir. Trip to Golden ring. Tour to the cities of Russia. Trip to Russia. Legendary tour. The city that gave way to Moscow as Russia's capital is now little different from a hundred other medium-sized Russian industrial towns - except that it has two of the most beautiful buildings in Russia, and a third stands a few kilometers away at Bogolyubovo. It's easy enough to take in the main sights in a few hours en route between Moscow and Suzdal. 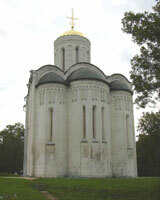 Vladimir has been recognized by UNESCO as one of the most valuable treasures of international heritage. Moscow succeeded Vladimir as the main city unifying the Russian lands into a single state only at the beginning of the 14th century. 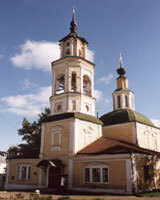 The city has well preserved unique monuments of Russian architecture. The 12th century St. Dimities Cathedral is known for its intricate white stone carvings. The national hero of Russia - Prince Alexander Nevsky - was buried in the crypt of the 12th century Nativity Cathedral. The city boasts a unique monument of military architecture. The Golden Gates-which are a symbol of the city. The local churches have frescoes done by the famous Russian icon-painters Andrey Rublev and Daniil Cherny. The pearl of Russian architecture, the Church of Intercession, is on the banks of the Neri River. Its exquisite shape has been admired by generations of visitors. Modern Vladimir is a regional administrative and cultural center with a population of 300,000. The unspoiled countryside, where old traditions are cherished and preserved, attracts many visitors. Vladimir was founded by Vladimir Monomakh of Kiev in 1108 as a fort in the Rostov-Suzdal principality that he gave to Yuri Dolgoruky, one of his younger sons. 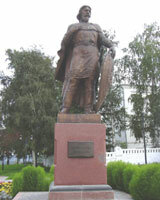 Under Yuri's son Andrey Bogolyubsky it became capital of the principality in 1157 or 1158, and capital of all Kyivan Rus after Kiev was sacked in 1169. Andrey and his brother Vsevolod III (1176-1212) consolidated themselves as the strongest Russian princes and brought builders and artists from as far away as Western Europe to give Vladimir a Kiev-like splendour. Devastated by the Tatars in 1238 and 1293, the city recovered each time, but its realm disintegrated into small princedoms with Moscow increasingly dominant. 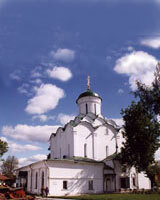 The head of the Russian Church resided here from 1300 to 1326, but then moved to Moscow. Worldly power finally shifted to Moscow around this time too. Even so, the rulers remained nominally Grand Princes of Vladimir until the 15th century. In the 20th century, Vladimir prospered anew on the back of textile, mechanical engineering and chemical industries. ASSUMPTION CATHEDRAL. Andrey Bogolyubsky announced Vladimir's succession to Kiev as the Russian capital with a northern white-stone version of Kiev's brick Byzantine churches. Begun in 1158, the Assumption Cathedral (Uspensky sobor) is simple but majestic in form and adorned with fine carving (innovative for the time). It was extended on all sides after a fire in the 1180s, becoming five aisles wide instead of three. The four outer domes were added then too. Since then it has changed little. Initially, the cathedral housed a Byzantine icon of the Virgin brought from Kiev by Andrey Bogolyubsky, which was already on its way to becoming Russia's most revered image, a national protector bestowing supreme status to the city that housed it. Moved to Moscow in 1390, it's now known as the Vladimir Icon of the Mother of God and since 1930 has been kept in the Tretyakov Gallery. Rublev and Daniil Chyorny, painted in 1408 in the central nave and inner south aisle, under the choir gallery towards the west end. Among them, in the central nave, are rows of haloed evangelists and angels, with realistic, sympathetic faces, and (on the ceiling) Christ with his right arm raised. CATHEDRAL OF ST. DMITRY. Vladimir-Suzdal stone carving reached its most amazing heights on the Cathedral of St Dmitry (Dmitrievsky sobor, 1193-97), the only surviving part of Vsevolod Ill's palace complex. The west doorway and the upper parts of all four walls are covered in an amazing profusion of stone images - a few of them Christian but mostly animal, vegetable and mythological. The top center of the north, south and west walls all show King David bewitching the birds and beasts with music, which may be an oblique way of complimenting Vsevolod, who appears in person at the top left of the north wall, with a baby son on his knee and other sons kneeling on each side. Above the right-hand window of the south wall, Alexander the Great ascends into heaven, a symbol of princely might; on the west wall appear the labors of Hercules. The cathedral is under restoration, but if you ask the people working there they will let you in. Inside, on the larger central vault beneath the gallery on the west side, are some beautiful 12th century frescoes of apostles and angels, almost certainly by Byzantine artists. GOLDEN GATE. 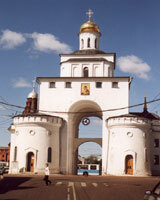 Vladimir's Golden Gate (Zolotie Vorota), part defensive tower, part triumphal arch, modeled on the very similar structure in Kiev, was built by Andrey Bogolyubsky to guard the main, western entrance to his city about 500m west of the Assumption Cathedral. Restored under Catherine the Great, the Golden Gate now houses a museum of Vladimir's military history, open from 10 am to 4 pm daily except Tuesday and the last Thursday.